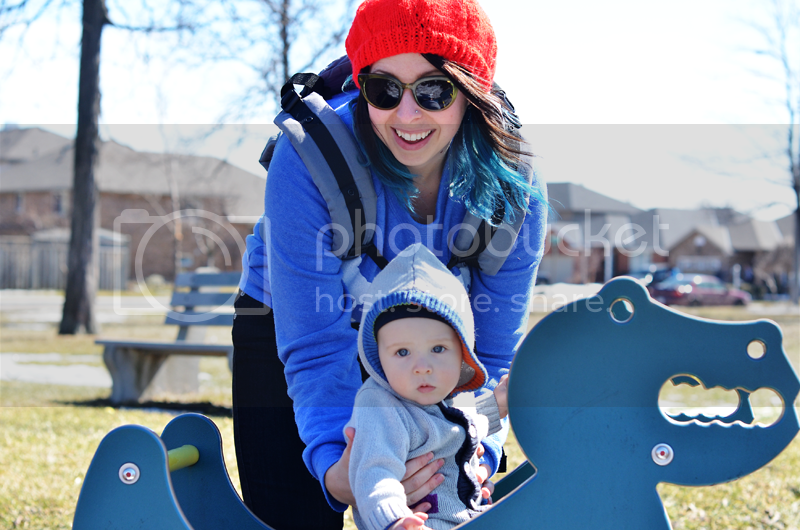 You can't tell from these photos but Milo seemed to enjoy his first trip to the park. 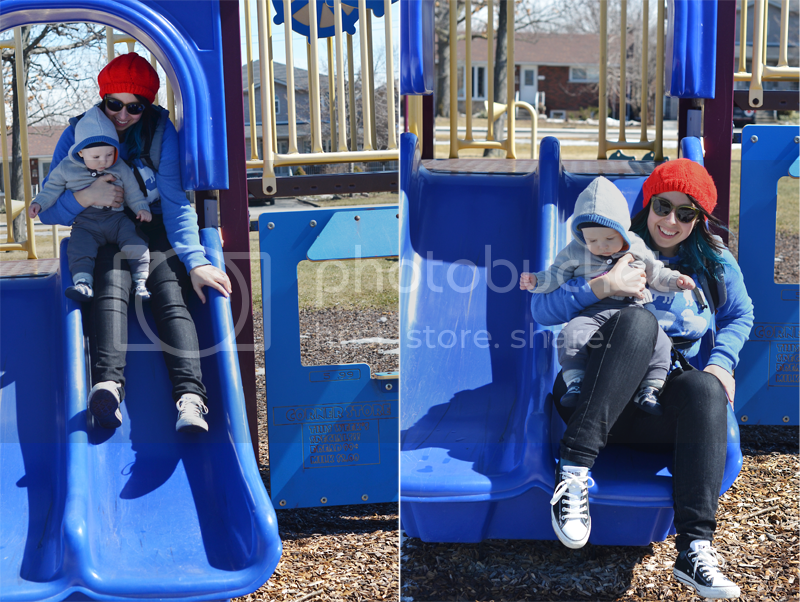 The weather was beautiful yesterday so we went for a walk and ended up stopping in at a playground in our neighbourhood. It is just so nice to get outside and do things! Nicer weather makes me feel a lot happier and more optimistic about life in general. This year it is also making me want to declutter and reorganize our whole house. We just have so much stuff. I am now really good about not obtaining new things but I sometimes still have a hard time getting rid of things I already have. One minute I want to just get rid of everything and then the next I'm thinking of how this or that might come in handy someday. I am infinitely better about this "I need to keep everything just in case" attitude than I was a few years ago but it really is difficult to change the way you think about things. I really want to simplify though so I'm working on it. I'm sure some of you guys struggle with the same thing, right? Well, I hope you are all enjoying some beautiful weather and I will talk to you all again soon! this post title made me laugh and yes, I am exactly the same when it comes to de-cluttering. "just in case" becomes like a little mantra. I really need to stop that because I really don't need most of my stuff. 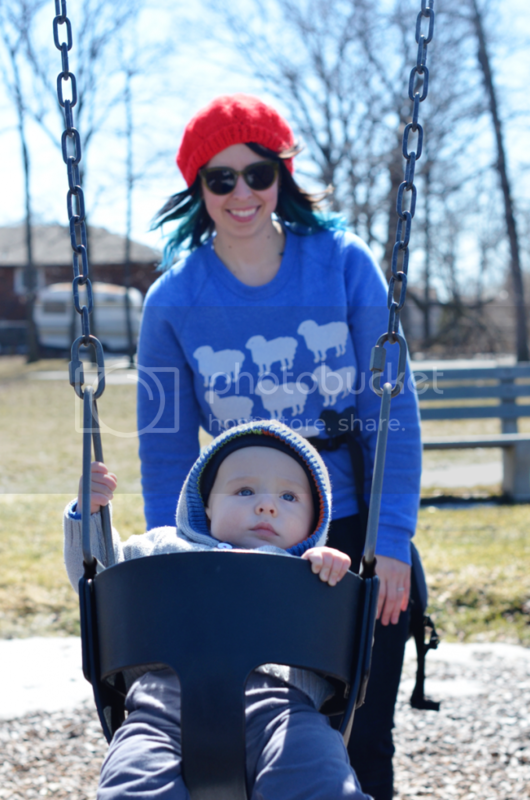 Even though Milo isn't smiling as much as you, these are v.cute pics! It's hard, right? I have to declutter when I'm in the right mood for sure! Sometimes my wife has a rough time letting go. I'm the opposite but if I do there's nothing like watching Hoarders on Netflix (not for the faint of heart) or visiting lovely miss Jen over at iheartorganizing.com she has three boys so she understands momentos, old toys and things that might come in handy. And she has great tips so you only need to do a small task a day, great for parents!! Hope you have so much fun organizing and getting ready for summer!! Oh gosh, watching Hoarders is hard for me because it is horrifying but I can relate to their feelings. Thanks for the recommendation, I opened the page (the address is actually iheartorganizing.blogspot.com if anyone else is looking for it) and I plan on checking it out more closely! You look lovely though! And happy! And he's definitely as cute as ever! Thank you Charity! This nice weather has definitely upped my happy. Oh my gosh Julie, I'm so sad to hear about your snow storm!! Hopefully Milo learns that the park is fun. 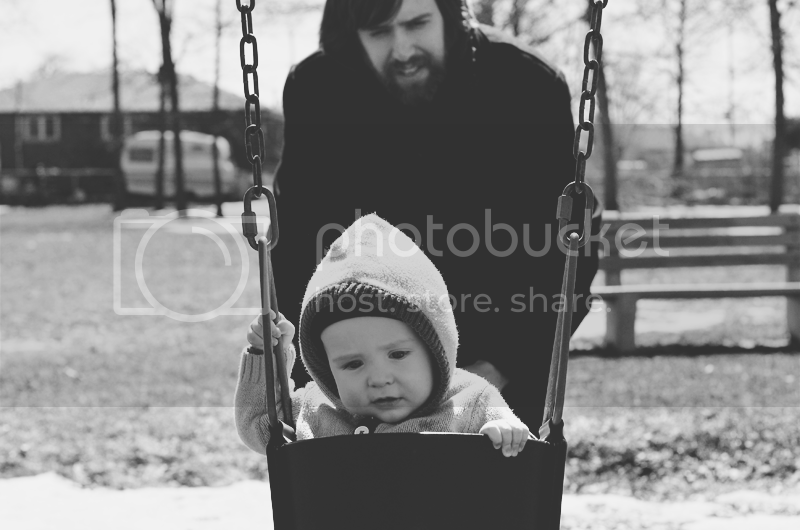 Actually, we went again yesterday and I sat on the swing with him in the carrier and he laughed. So far we have been pretty good at not accumulating a lot of baby things. I'm not looking forward to when he has a say in things. If he is anything like me as a child he will want to keep absolutely everything. Yes, it would be much better to get these urges in the winter!! Oh man, yes I remember the metal bars. I had totally forgotten about those. I do miss the huge tire swings that we had at our park though! Yeah, I'm getting really good at clothes and shoes. Sometimes though I go looking for something and then remember I got rid of it! What a little cutie! I remember when I first took my son to the park. 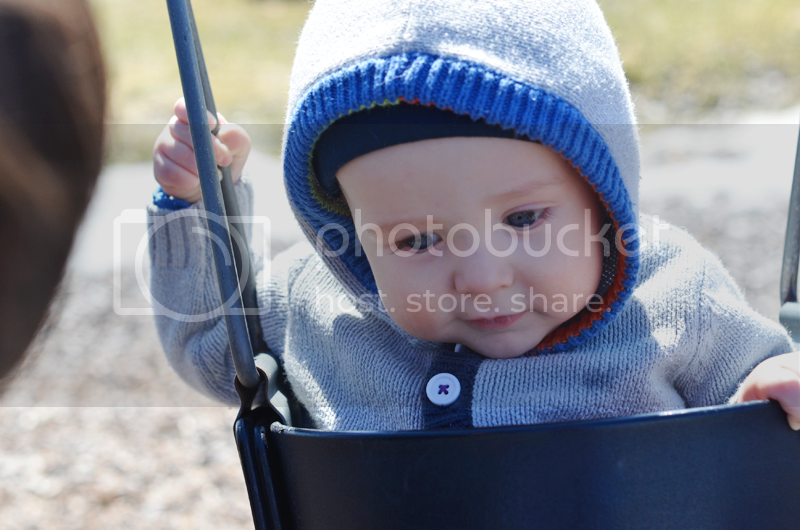 He loved everything, but the second we put him on the swing all hell would break loose. 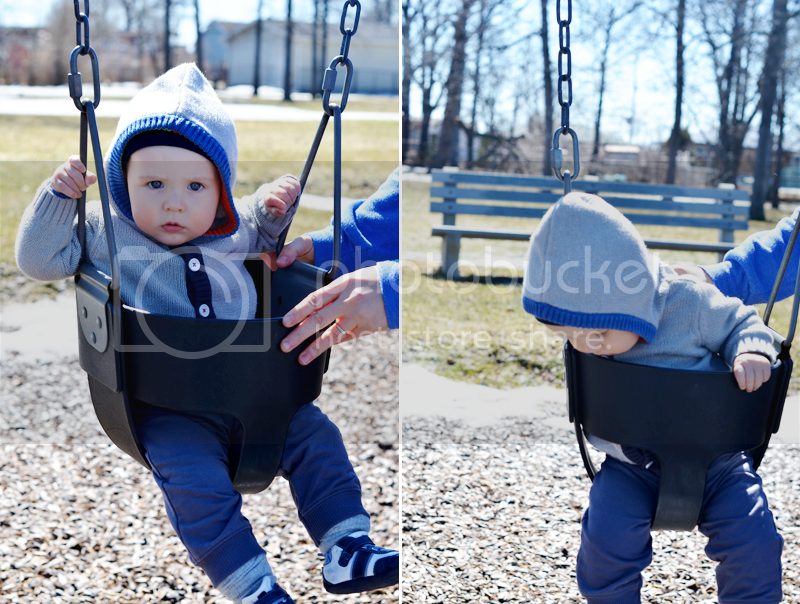 He's turning 5 in May and -still- he doesn't trust the swing (Though he does like throwing himself onto them and pretending he's flying!). He's an odd one, that's for sure. Awwww! That is so interesting. It is strange to see what scares them and what they love. Yes! We get rid of bags of things and then still have so much. I don't really remember accumulating new things. Sometimes though one of our parents turns up with some old things of ours that get added to the pile. Love the title of this post! Like one of your previous commenters, we're still pretty much covered in snow in Montreal due to another significant snowfall on the weekend. Winter just won't go away. I am very much looking forward to that nicer weather feeling. Beautiful pictures of the three of you. As the mummy of a not-so-smiley 6 month old, I enjoy all of the other (many) expressions that you see on babies....Milo seems to have them in spades! Such a cutie.